4 goal game is a transition soccer drill. The best teams have a strong ability to transition the ball up the park, and to get back defensively quickly. - Transition soccer is the focus in 4 goal game, set your grid approximately 30 by yards. - Set up 4 small goals 1-2 yards wide, 1 in each corner - Set up 2 teams, 4 v 4 - 7 v 7, with team A defending the 2 bottom goals, and team B defending the top 2 goals. - Teams can attack 2 goals, and must defend 2 goals. - Teams must look to transition quickly in both offense and defense. Attacking away from defenders, constantly finding open space. - Defensively teams must recover quickly and efficiently to protect all areas of the field, trying to prevent quick attacks. - Players should look to attack into open space, and where there are fewer defenders. - Defending team should look to get all players in a good defensive position as soon as their team loses the ball, no "lazy" players. - Encourage players to turn and attack in other direction, if one goal is well covered coach your players to not "force it" but rather, turn play backwards or simply turn to attack in other direction. - Players are not allowed to be "goalies" - Remember, encourage successes! - Limit players to 2 touch, or alternate 2 touch and 1 touch, for example if players before took 2, you must take 1. 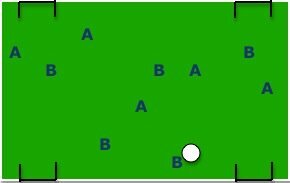 - Create a center line that all attacking players must be across in order for goal to count. This focuses on the team attacking as a unit and increase supporting angles. - Have players dribble through goal to score, preventing long shots that can slow down the drill at times. - 10-15 minutes for this Transition 4 goal game.